Bullock’s heart is a believed to have been originated in the Caribbean or South America. From there it spread to other areas and now it is grown in tropical areas all over the world. An erect deciduous tree with a rounded or spreading crown, 4.5 to 10 m high, trunk 25-35 cm wide;. Height ranges from 15 to 35 ft (4.5-10 m). Leaves alternate, oblong or narrow-lanceolate, 10-20 cm long, 2 5 cm wide, with conspicuous veins. 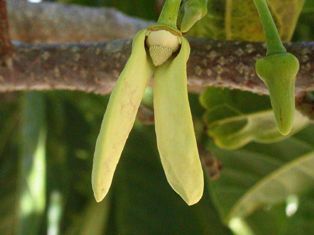 Flowers, slender, with 3 outer fleshy, narrow petals 2 – 3 cm long; light-green externally and pale-yellow with a dark-red or purple spot on the inside at the base, borne in drooping clusters, fragrant, never opening fully. Fruit, compound, 8-16 cm in diameter, may be symmetrically heart-shaped, lopsided, or irregular; or nearly round, or oblate, with a deep or shallow depression at the base; rind thin but tough, may be yellow or brownish when ripe, with a pink, reddish or brownish-red blush, and faintly, moderately, or distinctly reticulated; pulp thick, cream-white, custardlike, somewhat granular, sweet. Seeds glossy, oblong, smooth, 1.25 cm, 50-70 per fruit. Moisture, 68.3-80.1 g; protein, 1.17 – 2.47 g; carbohydrates, 20-25.2 g; fat, 0.5-0.6 g; total minerals, 0.5-1.11 g; calcium, 17.6-27 mg; phosphorus, 14.7-32.1 mg; iron, 0.42-1.14 mg; carotene, 0.007-0.018 mg; thiamine, 075-0.119 mg; riboflavin, 0.086-0.175 mg; niacin, 0.528-1.190; vitamin C, 15.0-44.4 mg, nicotinic acid, 0.5 mg; caalories, 80-101. The fruits are also made into a juice by squeezing through a sieve or cloth. The juice can be used as a flavoring in various desserts, especially ice cream (ice cream) and pudding. Beef heart is considered as a fruit that is rich in vitamins. As bullock’s heart is a plant from the tropics, so it grows best in warmn and humid regions. The plant can also grow in warm subtropical climate provided the minimum temperature does not fall below 2 C. An annual precipitation of 1200 mm has been considered the most optimum for growing this fruit. Seed is the most common and popular method of raising new plants. 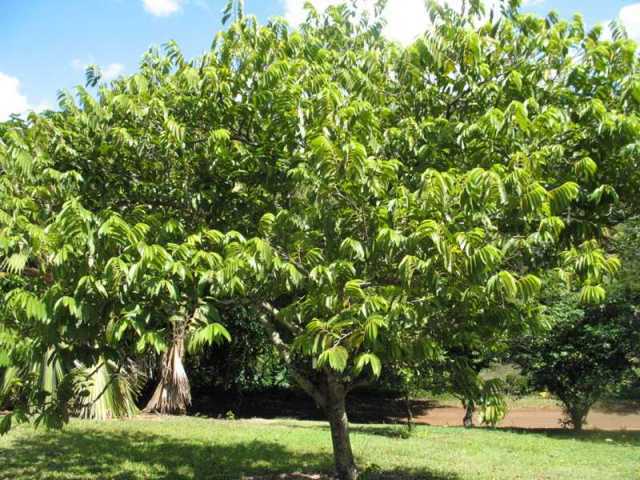 However, it can also be multiplied by inarching, budding or grafting on its own or soursop seedlings. New plants are planted at distance of 4-6 metres. 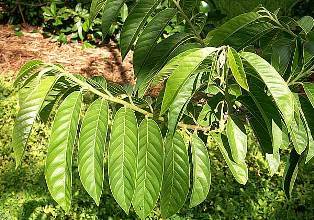 It is a fast-growing tree and responds very well to good cultural practices. 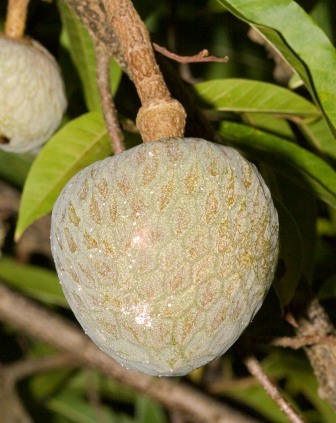 The shelf life of this fruit is not more than 2-4 days. So, care has to be taken after harvesting. If plants are looked after properly, a single tree of bullock’s heart can easily produce 40-50 kg of fruit in one season.